The call for submissions for Issue 5.2 is now open, and the deadline is Monday 22nd April 2019! ​Please email rob@jawsjournal.com for any queries. If you've missed the deadline, we are happy to accept submissions in advance! At JAWS we do not set themes for issues. With many of the editorial team being practicing artists we are well aware of the limitations felt when galleries push the work to fit the exhibition. Instead we would just like to see your best (a bit like your mum but with a Freudian dark side). All submissions must be accompanied by an abstract of no more than a hundred words and a list of keywords relating to the piece (e.g. review, Sarah Lucas, eggs, Whitechapel Gallery). We seek critical reviews of performance, exhibitions and texts/ art-books, essays with arguments at their heart, self contained extracts from research journals and reflective theoretical writing. Perhaps you have read a text and you disagree with its core argument, or can suggest a new interpretation or have applied a theory in a new way... we want to hear it! We also welcome extracts from research blogs and ongoing projects as long as they can stand alone in context. JAWS also seeks images, artworks, performances or processes, especially those connected to practice as research or visual enquiry. In light of our current editorial policy however, this should not be construed as a call for articles about function within a discipline but rather an intellectual engagement with practice. 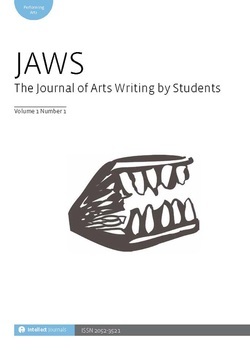 Submissions should be emailed as word documents to Rob@jawsjournal.com. For any further queries please email us or contact one of the JAWS team. · All work must be prefaced with an abstract of no more than 100 words and 6 - 8 keywords (e.g. Marxism, Painting, Walter Benjamin). · Please include a short bio at the end of your submission; include university affiliation and most recent course. · Written work of theoretical, discursive nature should not exceed 6000 words (including bibliography). · Written work of a review nature or opinion pieces should not exceed 3000 words. · We recommend that submissions of practice (i.e. practice-based, practice as research) be accompanied by between 3000 - 5000 words. The word count for this type of submission can be negotiated through the peer review and editing process. Often submissions involving practice fall under the umbrella of ‘unconventional’ submissions, so we ask authors to ensure they consider the peer reviewer guidance for unconventional submissions below. · Authors are responsible for securing the copyright for any images used. Images must be high res (300 dpi min), cited appropriately and be available as jpegs separate to the text. Images may be reproduced in black and white in the physical copy of the journal but will be colour in the digital version. · Work must be original, copyright of the author and not have been published elsewhere (including in full on personal blogs). We do accept work previously submitted for academic assessment. · All work should be comply to Harvard referencing style (see the Intellect Style guide) and use footnotes not endnotes. · Submissions to JAWS are subject to a double blind peer review process. Please see below for more details. 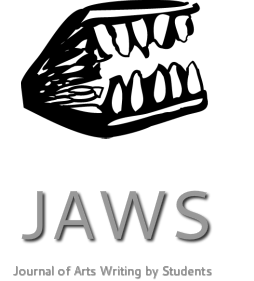 JAWS maintains an international network of student peer reviewers, which is constantly​ in flux. We are always looking for MA and PhD students to participate (email rob@jawsjournal.com), and it gives students insight into this key part of academia. We match our submissions with appropriate reviewers - a PhD submissions will be matched with two PhD peer reviewers from that discipline. We provide our peer reviewers with two sets of guidance, which you can see below: one for essay style submissions and the other for unconventional submissions. We strive to evolve our peer review system to accommodate practice, hence our unconventional guidance is updated each issue, and we invite our peer reviewers to participate in this. What reasons are given for use of experimental writing? Are you convinced that the reasons warrant use? Does the author support the experiment in relation to any existing theories or artistic practice/artwork? – If the author has invented their own method and does not put it in relation to any existing work (philosophic, artistic etc), then the reasons the author gives should be subject to additional scrutiny. Where possible, an author should be encouraged to refer to existing work – artists don’t act in a vacuum. If the experimental text is unclear, is there a legitimate reason why? i.e. the text is aimed at expression, it is supposed to be ambiguous, the author is trying to do something extra-textual. Example - If an author cites ‘performance/performativity’ as a reason why they are not following academic convention, a significant part of their submission must explicate exactly how they define the concept of ‘performance’ in relation to existing scholarship on the subject. What do the artworks do in relation to the text? As a journal we are open to all experiments between artwork and text, however we should discuss the success or failure of different authors attempts so as to better define what we expect as a journal. Does the methodology clearly state the rationale of the experiment? Is the methodology communicated through the documentation, positioning or sequencing of the artwork(s)? The journal format presents certain limitations in terms of the way submitted artworks will be viewed. Have these limitations been considered in the submission; could the relationship between the materiality/temporal nature of the documented work and the digital/physical formats of the journal be developed further? Instructions for peer review: When reading the submission consider the bullet points below. You can give up to a page of feedback for the submission, or at least a minimum of one paragraph. You can highlight any typos or grammatical errors in the submission directly in red; you can also add single-phrase comments (i.e. ‘unclear’, ‘unqualified statement’, ‘explain’, ‘expand’) to the text to highlight certain parts. The feedback you give will not be seen directly by the author, rather an editor will turn it into a list of recommended and required changes for the author. You must also make a recommendation for the submission, the options are to publish, publish with minor adjustments, publish with major adjustments, or do not publish. · Does the submission have 6 – 8 keywords and an abstract? · Is Harvard referencing followed? (Please ask for the Intellect style guide). · Are there any typos or grammatical errors? · Is the submission clear in terms of what the subject being discussed is? · Are there any issues with the submission? How do you propose that the author could resolve these issues? · In your expert opinion, are there any fallacies in the submission (incorrect subject knowledge, logical errors, poor interpretations)? Are the arguments convincing? · Does the submission have a good structure and flow (is a ‘narrative’ clear)? Is the submission good in terms of readability? · Is the submission an appropriate length? · Is the introduction and conclusion effective? · Are the sources or data used in the submission of appropriate quality? Are the sources used critically? · Are the voices (and writing style) used in the submission appropriate? · Is any analysis used in the submission of decent quality? · Is the purpose of the submission clear? Is there a question that is answered? · Are there certain parts of the submission that require changes? · Are uncommon terms properly defined? Are different iterations of a term clearly referenced and defined in relation to the purpose of the essay? (i.e. if terms have different definitions for different authors, is this properly acknowledged?). · Do you think the article requires images? [Editor to give advice to author on securing image rights if so].